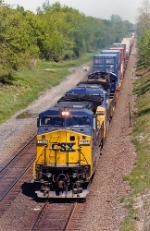 Description: CSX 7902 leads an intermodal train west at Milepost 215 in Little Falls. 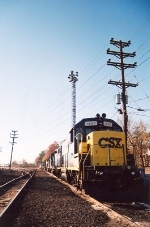 Description: CSX 7355 is on the point of Q-433 at Ridgefield Park, NJ 8/2004. Title: Freight train with SUPER power! Description: Rolling down One Track at 3:11 PM. Description: Leading an eastbound stack train on the ex-B&OCT mainline at Pine Junction. Title: CSX 7600 and 7355 sitting behind the gas station on Orange Ave. Description: Raising snowdust as the former Conrail pair rush eastwards through Perry past the disused signal gantry. Description: CSXT train Q155 southbound on the A-line at Callahan, FL. The signal maintainers' trucks are parked where the depot used to stand.